Here at Dowdeswell Forestry Services we have been growing and selling Christmas Trees since 1985. Year on year we see satisfied customers returning to buy their festive evergreen - whether it is the traditional Norway Spruce or the more resilient Nordmann Fir, we have a tree to suit everyone. We also supply many hotels and public houses, as well as some of the more famous residents of the Cotswolds area. You are very welcome to come up and browse, we will happily help you choose your tree and prepare the base to fit your stand. We also net the trees for you, giving you time to enjoy the wonderful views we have, some people say the best in the Cotswolds and soak up the family Christmas Atmosphere that is only found up here in Dowdeswell. 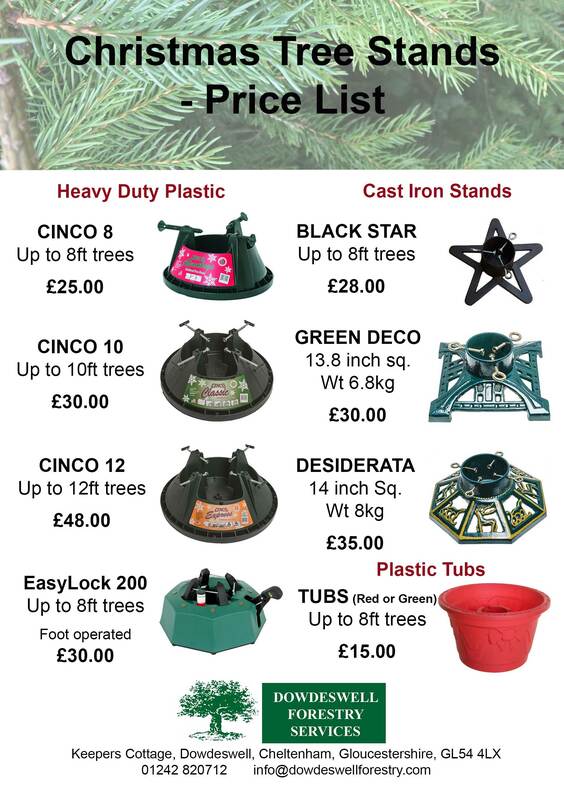 You'll find our prices below and we are still offering FREE DELIVERY on all Christmas Trees when placed in conjunction with load and half load log orders. We also offer our Christmas Tree Recycling service. After Christmas has ended, the decorations have been packed away for another year and all the mince pies have been eaten. Call Dowdeswell Forestry Services and we will come and collect your unwanted tree. ​If you are new to real Christmas trees, please click the Image on the left and download our handy guide to making the most out of your tree and how to prolong its life. We offer a range of sizes from 3ft to 15ft in 5 different varieties. Please come up and choose your own from our extensive selection of Nordmann Fir, Norway Spruce, Fraser Fir, Noble Fir and Lodgepole Pine. The Nordmann Fir is the most popular Christmas tree in Europe, they have soft foliage and they retain their needles better than the traditional spruce, reducing the need to vacuum them up constantly. The needles have a thick waxy coating which makes this tree a good choice if you suffer from allergies These trees ideal for homes with children and pets. Norway Spruce are the Original Christmas tree, the most traditional you can buy, first used by the Victorians. ​It is well known for its lovely 'Christmassy' scent. These should be brought in the house as close to Christmas as possible as they don't cope very well with our modern day heated houses. To help your spruce thrive a little longer, you must keep it away from the any heat sources i.e Radiators/Fires/Underfloor Heating and you must water it every day! 15-18ft Order only, price on request. © COPYRIGHT 2018 - DOWDESWELL FORESTRY SERVICES.. ALL RIGHTS RESERVED.